What are the Requirements of a Medical Malpractice Claim? Why Is It Important to Have an Experienced Lawyer in a Medical Malpractice Case? 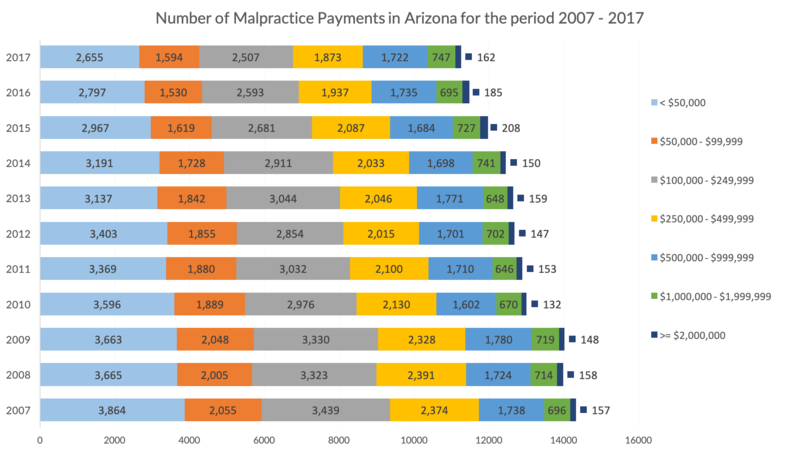 Arizona Medical Malpractice Payment Records. What are Arizona’s Medical Malpractice Laws? Record of Success in Medical Malpractice Cases. Arizona Medical Malpractice Facts and Frequently Asked Questions. While most medical professionals act ethically, there are some whose behavior causes damage or harm. Whether it was the gross negligence of a doctor or the poor hiring practices of a hospital, patients shouldn’t have to pay for the incompetence of people they trust with their health. The lawyers of The Law Offices of William D. Black are experienced in representing people who have experienced medical malpractice. These cases can often be more complicated and more difficult than other types of lawsuits, but our attorneys fully understand the gravity of the situation and know how to help victims receive the compensation that they deserve. When medical professionals or entities harm a patient or patients due to negligence or wrongful actions, the injured parties may pursue a claim of medical malpractice. Generally, malpractice occurs when a medical professional – a doctor, nurse, or hospital agent – acts in a way that someone with a similar background and training would not have. If you or a loved one have sustained an injury due to the negligence of a medical professional, speak with an attorney who specializes in medical malpractice claims in Phoenix. Not all mistakes in medical treatment are due to negligence or incompetence, and, even when they are, the injuries must meet a certain legal threshold. Just because a doctor or nurse makes a mistake, it doesn’t necessarily mean a plaintiff can file a lawsuit. The plaintiff must have suffered real harm that leads to the need for further medical care or directly impacted a person’s future. First and foremost, the injured person, or plaintiff, must prove a formal medical relationship existed. This means the plaintiff must have been a patient of the person whose neglect caused the injury. If you received unofficial advice or direction from a medical professional but you were not that doctor’s patient, you do not have grounds to file a lawsuit against them. For instance, medical advice at a dinner party doesn’t meet the threshold for a medical malpractice claim. One of the most difficult pieces of evidence for the plaintiff to prove is negligence. It is not uncommon for someone to be displeased or upset because of a medical outcome. Sometimes, the outcome is out of the doctor’s control. Because of this, it is necessary to prove the medical professional acted incompetently – and that incompetence leads to the plaintiff’s injury. You also need to prove that it was the aforementioned negligence that caused the injury. Usually, when a doctor is working with a patient, the patient is already ill or hurt in some way, sometimes even on the verge of dying. Therefore, whether the doctor’s direct actions are the reason for the final damage or whether it was another pre-existing condition that caused the bad outcome is not always clear. The plaintiff – and his or her attorney – must prove it was the medical professional’s actions that caused the harm to pursue a claim. If the plaintiff is able to prove medical malpractice occurred, the negligent party may owe the injured party compensation for medical bills, lost wages, and the physical pain and mental anguish that ensued as a result of the injury. Medical malpractice cases are not like other types of lawsuits. There are many special rules and procedures that can make them extremely complicated and difficult to navigate without an experienced attorney who understands Arizona law. Regulations concerning medical malpractice vary among states, so it’s important to have an attorney who is experienced in handling Phoenix medical malpractice cases. Like other states, Arizona has a statute of limitations for medical malpractice claims – a time limit for how long a patient has to file a claim. In Phoenix, Arizona, plaintiffs have two years from the time he or she discovered there was an injury. Discovery is the key here. In Arizona, there is no specific limitation for this date. The discovery rule simply extends the standard deadline until the victim should have reasonably discovered the harm that he or she had suffered. For instance, if a surgeon operated on the wrong leg, the patient would know immediately that they had been negligent, which would be when the clock starts. However, if a doctor fails to recognize obvious signs of breast cancer in a woman, she may not realize the mistake until months later. In this case, the clock begins when the patient realizes she has cancer. For a minor or their legal guardian, the standard deadline for the statute of limitation does not start until the child has turned 18. It is important that you consult a Phoenix medical malpractice attorney as soon as possible after you think that you have suffered an injury due to medical malpractice because the defense may dispute when your date of discovery was. The sooner you initiate a claim, the better for your case. Arizona does also allow for other exceptions regarding discovery for medical malpractice; if the person accused of malpractice left the state after committing the malpractice if the victim was mentally ill, and a few other exceptions may extend the discovery date for filers. Data source: National Practitioner Data Bank (2017): Adverse Action and Medical Malpractice Reports (1990-2017). Childbirth errors. Labor and delivery procedures have many nurses and doctors working as a team to protect both mother and child. When one person is negligent, it could lead to grave harms. Failure to diagnose. There are certain standards for ailments that doctors should be able to reliably recognize and, if they do not diagnose them, the law may consider it negligence. This misdiagnosis can also lead to dangerous, possibly even fatal, consequences for the patient. Anesthesia miscalculations. The balance of drugs necessary to put someone under during a medical procedure is very delicate – calculations must be precise. If they aren’t, patients may aware of surgeries and feel the procedure – but be unable to tell anyone. Conversely, it’s possible that too much anesthesia may result in death. Defective medical products. There are many medical products on the market that have caused injury to countless people. A few of these products include some pacemakers, defective hip or knee joints, leaking heart valves, mesh filters for DVT, some gynecological devices, and transvaginal mesh devices – among others. Medication diagnosis errors. Prescribing the wrong medication or the wrong dosage may set the patient on a course that would not result in a remission of the patient’s symptoms. If a medical professional makes treatment decisions that culminate in damage to the patient, and if those treatments would not have been recommended by a healthcare professional with similar background and training, then the medical professional may be responsible for the injury to the patient. Surgical errors. No surgeon enters the operating room planning to harm a patient, but, unfortunately, it often happens. Whether the doctor was inebriated when he or she operated or was simply grossly negligent, when a surgeon makes a mistake on the operating table, it’s the patient who suffers. If this has happened to you or a loved one, you should seek compensation for your losses. Part of the responsibility of a medical professional is to make the patient aware of any risks or consequences of a procedure or treatment. To make a reasonable choice about whether to undergo treatment, medical professionals must explain the risks involved and what the chances are of a successful outcome. If a patient chooses a course of action that is damaging, but no one ever informed the patient of the risks, the doctor may be liable in a medical malpractice suit. Medical malpractice laws vary among states. While some states limit the amount of damages the courts can award a victim of medical malpractice, in Arizona, there is no limit on the amount of money a victim can receive in a civil case. During a medical malpractice lawsuit, the defendant may suggest the patient was at fault, or at least partially responsible. If this happens in an Arizona court, and the defendant proves the patient was responsible for part of an injury, the court will reduce the compensation award by percentage of fault. The law calls this rule pure comparative negligence. In this situation, the defendant and plaintiff share fault, but if the plaintiff is less than 50% to blame, he or she will still receive an award. In Arizona, there are certain rules regarding what constitutes medical expert certification. If medical expert testimony is necessary, the plaintiff’s attorney must file affidavits as to the defendant’s negligence. Additionally, the expert must be in the same medical field as the defendant. If you believe you have experienced medical malpractice, it is important to get legal help from a team who has experience with Arizona medical malpractice claims. Medical malpractice suits are very complex. It is as important to choose an expert who has experience in this specialty as it is to choose a healthcare professional who specializes in your ailment. You need attorneys who will fight for you and do all they can to get you the compensation that you deserve. Contact The Law Offices of William D. Black in Phoenix, Arizona for support and reliable representation during your lawsuit. William D. Black has over 25 years of experience with medical malpractice lawsuits and approaches each case with knowledge, focus, and a personalized strategy that will work best for you. The vast majority of health care providers in Arizona do not commit mistakes or behave negligently. However, thousands of patients in Arizona are injured or die each year as a result of negligent and irresponsible medical professionals. Victims deserve justice. The Law Offices of William D. Black know how to pursue justice for victims of medical malpractice in Arizona. These cases are often extremely complex. They may involve catastrophic damages. Large sums of money may be at stake. Because the sums of money may be quite significant and because the stakes may be so high, lawyers with extensive experience and resources are vital for pursuing justice and compensation on behalf of victims. For a free consultation about Arizona medical malpractice lawsuits, call us at (602) 265-2600 or (844) 224-0054. Speak with Phoenix Medical Malpractice Attorney William D. Black and receive candid and clear legal advice from an attorney with more than 25 years of experience with Arizona medical malpractice lawsuits. What are your chances of getting a settlement from your healthcare provider? How long will an Arizona medical malpractice lawsuit take to resolve? What specific Arizona liability laws might impact a particular case? Will a courtroom appearance be required? What are some legal strategies a medical malpractice attorney will use to fight on my behalf? If another law firm has declined my case, will the Law Offices of William D. Black consider taking it? How much compensation is available for injuries resulting from medical malpractice in Arizona? Does Arizona place a cap on how much compensation can be awarded? The above represent only a small sample of the many questions you may have about your case. And since every case is unique, you deserve specific answers to your particular questions. You also deserve legal representation that is tailored to your concerns. The Law Offices of William D. Black will take the time to listen to your concerns and offer you customized legal representation. Contact us as soon as possible and we will determine if your case has merit. If it does and we represent you, we will be your tireless advocates and use all of our experience and resources to fight on your behalf. If you or a family member has been the victim of medical malpractice in Arizona, the law is on your side. Although no amount of money will ever compensate you for medical malpractice in Arizona, victims and their families may be entitled to financial relief through the pursuit of a claim. If a claim does not lead to a satisfactory outcome, a lawsuit under Arizona medical malpractice law or the Arizona wrongful death statute may be necessary. Though most cases are settled through out-of-court negotiations, if your case must proceed to trial, our law firm is more than equipped to be your champion in court. How is medical malpractice defined in Arizona? Medical malpractice is the failure of a health care provider to comply with the applicable standard of care. A health care provider must “exercise that degree of care, skill and learning expected of a reasonable, prudent health care provider in the profession or class to which he or she belongs within the state acting in the same or similar circumstances. Failing to do so, however, will not by itself create liability.” Not all errors in medical diagnosis and treatment are necessarily malpractice because there are certain risks and margins for error that arise inherently in the practice of medicine. A bad result does not automatically mean the medical provider was negligent. Is there a cap on how much can be recovered in a medical malpractice lawsuit? Arizona does not place a cap on the amount of damages recoverable in a medical malpractice action. Article 2, § 31 of the Arizona Constitution prohibits the enactment of any law limiting the damages one may recover for personal injury or death. However, an amendment to the state’s Constitution is possible. There seems to be widespread support for such a cap to be enacted. The most vociferous support for such a cap comes from people who have not endured the tragic consequences of medical malpractice. Who can bring medical malpractice claim or legal action? These can be brought by the injured person or, if deceased, by his or her surviving relatives against any responsible health care provider, including physicians, hospitals, counselors, psychologists, psychiatrists or psychotherapists. However, in most cases, there is a statute of limitations. A claim must be filed, typically, within two years of injury or death. Who is liable when medical malpractice occurs? Health care providers, including doctors and nurses, often are liable. Individual providers may be named as defendants and, often, many doctors and nurses share a percentage of liability for injury to victims. The hospital or health care facility may also be held liable if their vetting processes or the conditions at their facilities are inadequate. Many of these health care providers will employ armies of lawyers and support staff to fight all claims brought against them. Even in cases where negligence is quite clear, the defendant may aggressively fight to pay fair compensation. In some cases, they may offer a very low settlement amount. Because they will be so resistant to paying—and because they have the resources to fight claims and lawsuits—hiring an experienced medical malpractice attorney is essential.